Powers away brake dust and road grime. Fast-acting, non-acid formula leaves wheels clean and bright. Safe on virtually all types of wheels. 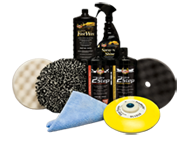 Eliminates worry about cleaner and wheel compatibility. My Subaru has front disc brakes and the front wheels constantly look filthy. Before I wash my car, I spray down the wheels and tires with Non-Acid Tire and Wheel and let is sit for a few minutes. Then, I simply hose it off and the wheels come out looking clean and brite without even using a wheel brush.